An Israeli settler deliberately ran over a Palestinian child in the occupied east Jerusalem town of Silwan, on Thursday, according to Wadi Hilweh Information Center. A source at the center told WAFA that a settler’s armored vehicle ran over a 10-year-old child in a deliberate hit and run assault while passing near the settlement outpost of ‘Beit Yehonatan’ (Jonathan's House), built illegally on Silwan’s land. The child reportedly sustained fractures in his hands and was transferred to hospital for treatment; his condition was described as "moderate". In related news, Israeli forces kidnapped three Palestinians from districts of Bethlehem, Tubas and Hebron, according to reports by security sources and the Palestinian Prisoners' Society. Forces raided the neighborhood of al-‘Attan Street, in Bethlehem city, where they abducted a 25-year-old Palestinian after breaking into and violently searching his home. 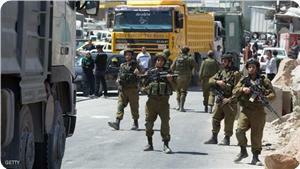 Similar raids were conducted in Wadi Abu Freiha, in Beit Sahour, and Jabal al-Mawaleh neighborhood, in Bethlehem. However, no abductions were reported. Meanwhile, forces kidnapped a 27-year-old Palestinian after breaking into his home in Tubas. Forces also raided the Old City of Hebron, where they took a 30-year-old Palestinian. Furthermore, WAFA reports that Israeli authorities have decided to close al-Jalama checkpoint for three days, over the two-day Jewish New Year holiday. As a result, Palestinians from the occupied West Bank and those living in Israel will be denied access to Israel and the West Bank respectively. The Al-Jalama checkpoint is located between the occupied West Bank and Israel, near Al- Jalama village, to the north of Jenin. Israeli forces enlarged the checkpoint and installed an additional security gate on Palestinian-owned land seized from Al-Jalama residents. The checkpoint will be reopened on Saturday from 10:30 a.m. to 8:30 p.m.
Israeli navy forces opened fire at Palestinian fishermen early Thursday off Gaza’s coast, according to Palestinian sources. 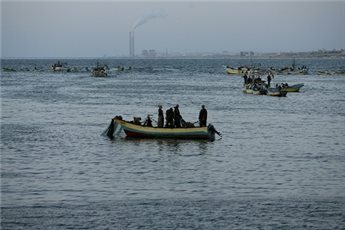 The Israeli naval boats opened fire at fishermen off the coast of Gaza with no injuries reported, the sources confirmed. Israeli navy attacks have recently escalated injuring a number of fishermen in the process and arresting others in clear violation of the ceasefire agreement reached on Aug. 26 under Egyptian mediation. The Israeli occupation army and security apparatuses intend to impose tight security measures in and around the West Bank and occupied Jerusalem as of Thursday on the occasion of the Jewish new year (Rosh Hashanah), according to the public Hebrew radio. The radio added that the Israeli army had already been put on high alert in all border areas, especially along the border with Syria. The Palestinian Authority security forces, in turn, intensified their presence throughout the West Bank to maintain calm and order during the Jewish occasion, the radio noted. At least 20 Palestinian citizens were treated for critical breathing disorders after they inhaled tear gas heavily discharged by the Israeli occupation forces (IOF) throughout a wave of violent clashes that rocked a town to the west of Jenin on Wednesday evening. Local sources said the clashes burst out after a large number of Israeli occupation troops, coming from the Salem military camp, cordoned off Zabouba town, to the west of Jenin, and interrogated Palestinian civilians under flimsy pretexts. 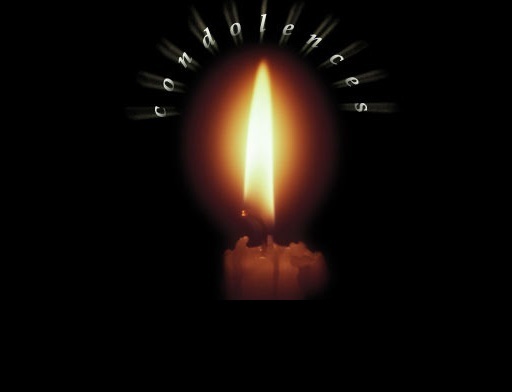 IOF attacks culminated in the launch of a large-scale combing operation after having stormed the town, encircled all of its residential quarters, and denied Palestinians’ access out of and into the area. By-standers at the scene said the Israeli occupation soldiers pitched a flying military checkpoint at the main entrance to the town, along the Jenin-Haifa street, creating a traffic congestion in the process. 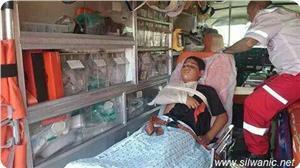 The invading IOF patrols targeted the Palestinian unarmed youngsters with random barrages of tear gas grenades. Dozens were left suffering suffocation as a result of inhaling gas. In a related development, heavy waves of rubber bullets, live ammunition, and tear gas grenades were discharged by the IOF on a group of Palestinian unarmed youngsters near the military Ofer detention center at dawn Thursday. The Palestinian youngsters responded by setting an Israeli military watchtower adjacent to the Ofer detention center ablaze so as to foil Israeli snipers’ attempts to shoot young civilians. 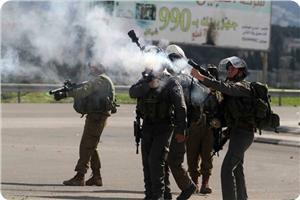 Scores of Palestinian citizens were treated for breathing disorders noontime on Wednesday after they inhaled tear gas heavily unleashed by the Israeli occupation forces (IOF) during the clashes that burst out at Bethlehem’s Aida refugee camp and al-Khader town. Palestinian activist at the Aida refugee camp, Ibrahim Moslem, said the invading IOF patrols stationed around the separation barrier so as to provide a shield for the thousands of Israeli extremist settlers who flocked into the so-called Rachel’s Tomb to mark the Rosh Hashanah (Jewish New Year). The settler mass-spree was carried out in such a remarkably provocative and over-zealous manner so as to cheese off the Palestinian Muslim youths, who could only react by hurling stones as a means to voice their disapproval over such fanatical influxes. Critical injuries have been reported as the Israeli occupation troops targeted the Palestinian unarmed youths with heavy barrages of tear gas and kept chasing them in the camp’s alleys and adjacent streets. Meanwhile, several cases of breathing disorders and black-outs were documented among a number of al-Khader schoolchildren and citizens due to the waves of tear gas grenades discharged by the IOF across Bethlehem’s Old City, a PIC correspondent quoted local sources as reporting. The Israeli internal security minister Yitzhak Aharonovich beefed up a wave of settler attacks targeting the non-violent Muslim worshippers at holy al-Aqsa Mosque after he stormed the compound on Wednesday morning, the Aqsa Foundation for Endowment and Heritage said. By-standers at the scene and Israeli media sources said Aharonovich forced his way into the Buraq Square near holy al-Aqsa early on Wednesday and had assisted, in person, the break-ins. The Israeli occupation minister gave a personal and military boost to a wave of sacrilegious attacks carried out by at least 117 vandals and the Israeli housing minister Uri Arial. The Israeli occupation police have come down heavily on dozens of Palestinian worshippers and sit-inners outside and inside of the mosque, leaving scores among them, including Islamic leaders, severely wounded. The Israeli occupation has been outlining a bid for a mass-desecration break-in to be staged by fanatic settler hordes and Jewish gangs but the heavy presence of Muslim sit-inners at and around the mosque foiled such defilement schemes. Moments before al-Dhuhr (noon) prayers the occupation police toned down grips on al-Aqsa compound after a group of Muslim congregation and sit-inners maintaining vigil at al-Aqsa gates stepped up pressure. Hundreds of peaceful worshippers and sit-inners rallied in the mosque yelling “Allah is the Greatest” to reverberate their firm disapproval of such deplorable vandalism against Muslim’s holy Mosque. Today (sept 23) at Salaymeh checkpoint in Hebron, Israeli forces fired 29 rounds of tear gas and 5 stun grenades at children going to school. International Solidarity Movement (ISM) activists then left Salaymeh checkpoint and headed over to Qeitun checkpoint around 5 minutes away as they heard the firing of tear gas. At Qeitun checkpoint clashes had erupted and were underway between unarmed Palestinian youth and Israeli forces. An excessive amount of tear gas was used in addition to rubber coated steel bullets and stun grenades. years old, in front of them attempting to get to school. Later on the Israeli forces threw stun grenades and brutally grabbed and arrested two young Palestinian boys between the ages of 14 and 15 years old. One of the boys whilst in a headlock and handcuffed was punched several times in the side. ISM activists ran up to ask the boys their names and correct ages but the Israeli forces were very hostile. They were both forced through the turnstiles and were kept at the checkpoint for a few minutes before Israeli forces marched them to the police station near the Ibrahimi mosque. Palestinian medical sources have reported, Wednesday, that dozens of worshipers suffered the effects of teargas inhalation in the yards of the al-Aqsa mosque, in occupied Jerusalem, after dozens of soldiers invaded the area. 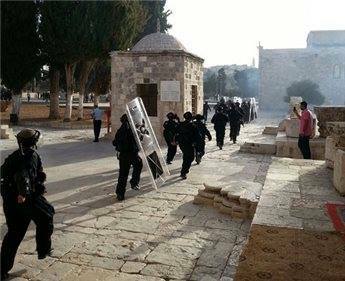 The sources said that soldiers invaded the mosque yards through the al-Magharba Gate, and attacked many worshipers attempting to stop Israeli fanatics who have been trying to invade it, the Palestinian TV said. It added that the soldiers imposed a tight siege around the mosque, especially the al-Qibli mosque of al-Aqsa, and prevented dozens of worshipers from entering the entire vicinity of al-Aqsa mosque. Eyewitnesses said dozens of soldiers imposed a strict siege on the mosque since early dawn hours, preventing all women and younger men from entering it. Dozens of Palestinians had to perform dawn prayers in streets and alleys close to the mosque and the Old City of Jerusalem. Early Tuesday, eight Palestinians, including two minors, were kidnapped by Israel forces from the West Bank, according to reports by local security sources and activists. WAFA reports that, in the Bethlehem district, Israeli forces raided Taqou‘ to the east of the city, where they arrested three Palestinians between the ages of 17 and 19 years after breaking into and ransacking their homes. They also raided Aida refugee camp to the north of the city, where they abducted one Palestinian after breaking into and ransacking his home. Israeli troops also raided the neighborhood of al-Kharruba, in Jenin, taking one Palestinian after storming his home in a similar fashion. Using canine dogs, troops also raided al-Marah neighborhood, where they kidnapped a 17-year-old Palestinian after breaking into his home. In the Ramallah district, troops took into custody a student of Birzeit University, who is also a resident of Jenin, after breaking into the school's dormitory, according to the Palestinian Prisoners' Society. Furthermore, in the Jericho district, troops abducted a Palestinian from Aqbat Jaber, after breaking into and ransacking his home. In related Tuesday news, WAFA reports that three Palestinians were shot and injured, while dozens of others suffocated from teargas inhalation, during clashes with Israeli forces in Hebron. 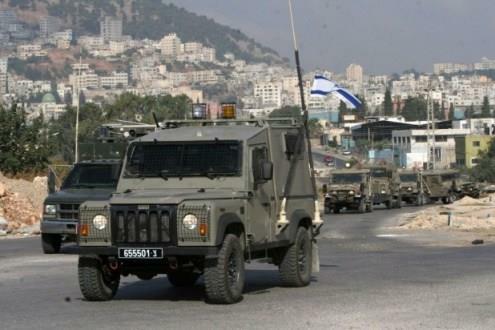 According to security sources, the clashes erupted in the Hebron University neighborhood and Tareq Bin Ziad junction. Israeli troops fired rubber-coated steel bullets and tear gas canisters at local residents and students, injuring three and causing dozens others to suffer from excessive tear gas inhalation. Two Palestinians were reported to have been directly injured in the head and the knee, and were evacuated to a Hebron hospital; suffocation cases were treated at the scene. The clashes erupted just following the killing of Marwan Al Qawasmi and 'Amer Abu 'Aisha, two Palestinians Israel had accused (without proof) of the fatal abduction of three Israeli teenagers on June 12 of this year. Israeli Occupation Forces (IOF) stormed at dawn Tuesday West Bank cities of Nablus, Jenin, Bethlehem, and al-Khalil which led to the outbreak of violent clashes. In Nablus, IOF soldiers fired tear gas bombs at Palestinian youths who in their turn responded by throwing stones, local sources in Burin town said. The sources said that Israeli forces surrounded a Palestinian home in the town which prompted young men to throw Molotov Cocktails at the Israeli patrols. No arrests were reported. In Jenin, IOF soldiers stormed Burqin and Qabatia towns where two youths were arrested and took to unknown destinations after breaking into their homes. A military checkpoint was erected at the entrance to Qabatia town, restricting people’s movement. Israeli forces had also stormed on Monday evening Kafr Dan in Jenin where they carried out raid and combing operations. A number of homes and agricultural facilities were violently stormed. In al-Khalil, Israeli soldiers detained two citizens after storming and searching their homes in Aroub refugee camp. In Bethlehem, more than ten persons were injured on Monday evening during clashes that erupted in Aida refugee camp when Israeli forces heavily fired tear gas bombs and rubber bullets at Palestinian citizens. Palestinian youths, for their part, used fireworks and stones during the clashes that lasted for four hours. The Israeli navy on Monday evening rounded up four Palestinian fishermen on board their fishing boats off the coasts of central Gaza in a renewed flagrant violation of the Cairo-brokered truce accord. “The Israeli navy cordoned off a boat and abducted the four Palestinian fishermen who were on board,” head of the Fishermen’s Syndicate in Gaza, Nizar Ayyash, told SAFA News Agency. The arrest took place despite the fact that Palestinian fishermen were setting sail within the six nautical miles guaranteed by the Palestinian-Israeli ceasefire agreement, signed on August 26. 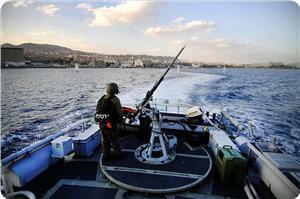 In an earlier incident, over the last couple of weeks, the Israeli navy forces nabbed six Palestinian fishermen and unleashed machinegun fire on Palestinians’ fishing boats. In a related incident, the Israeli fighter jets launched a spate of mock raids on the Gaza Strip on Monday evening, triggering panic among the besieged enclave’s inhabitants, local sources told a PIC news reporter. A drove of Israeli occupation warplanes kept hovering in Gaza’s airspace, particularly off the Strip’s shores, in a remarkably unprecedented manner, the same source further reported. Meanwhile, Hamas and Islamic Jihad delegates headed to Cairo on Monday to set the stage for another round of indirect truce talks with the Israeli side. Israeli police assaulted, this past Wednesday, 16-year old Shadi Raed Ghurab as he was walking along Nablus Street, in occupied East Jerusalem. Police severely beat the boy with batons while being detained in the interrogation room, at the Salah Eddin Street police station, according to Jerusalem's Wadi Hilweh Information Center. The Center noted that he suffered fractures in his arm and leg, as seen in the photo. 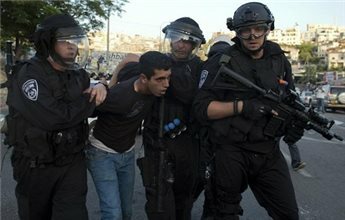 Shadi explained that an officer detained him on Nablus Street and, then, took him to Salah Eddin Street police station. After the interrogator entered the room, he mocked the child for being a resident of the Al-Thori neighborhood, which resulted in a number of verbal altercations. Additionally, according to the boy's testimony, the interrogator then transferred him to a different room which did not have any cameras, upon which he was assaulted by not one but three officers. Shadi explained that he was able to leave the station during the arrest of another young man, and was then transferred to Al-Maqased hospital for treatment. Such inhumane treatment of Palestinians is a common occurrence, by both Israeli authorities and civilian settlers alike. See also, from Wadi Hilweh Info Center, "In pictures: The police arrest the 9-year old Qusai Ashoor and detain him for hours"
Several Israeli military vehicles carried out, on Friday morning, a limited invasion into al-Qarara town, east of Khan Younis district, in the southern part of the Gaza Strip. 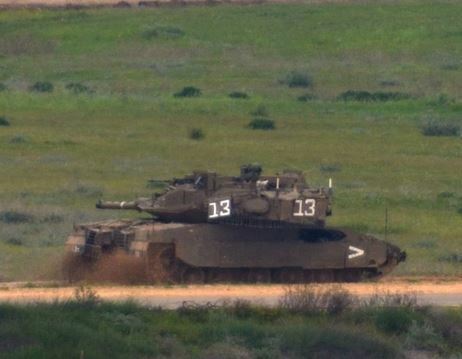 Local sources said that a number of vehicles, and four army bulldozers stationed at the Kissufim military base, near the Gaza border fence, advanced around 100 meters into Palestinian agricultural lands. The army carries out repeated invasions into border areas in the Gaza Strip, bulldozes and uproots farmlands, and in many cases opens fire at random in an attempt to force the farmers and workers to leave their lands, close to the border fence. The Israeli Navi also continued its violations against the fishermen, and their boats, in Gaza waters, in direct violation of the latest ceasefire agreement, and many earlier ceasefire deals. Medical sources reported, on Thursday evening, that several Palestinians received treatment for the effects of tear gas inhalation, after dozens of soldiers invaded two villages near the northern West Bank city of Jenin. The sources said that residents have been injured in Zababda town and Mslayia village, after the soldiers invaded the two communities and fired gas bombs and concussion grenades, to provoke clashes with the locals. Also on Thursday evening, soldiers kidnapped a young Palestinian man while he was crossing a military roadblock near Barta’a ash-Sharqiyya village, near Jenin. Mohammad Yousef Waked, 23, from the al-‘Arqa village, was taken prisoner at a military roadblock which closed off the main entrance of Barta’a ash-Sharqiyya. In related news, soldiers installed a roadblock between the villages of Zabbouba and Rommana, west of Jenin, stopped and searched dozens of vehicles, and investigated the ID cards of the passengers. In Hebron, in the southern part of the occupied West Bank, soldiers kidnapped two Palestinians from Beit Ummar village, north of the city. Coordinator of the Popular Committee against the Wall and Settlements, Mohammad Awad, stated that dozens of soldiers invaded the town after closing its entrances, kidnapped two Palestinians, and detained two others. Awad said the soldiers kidnapped Eyad Khalil Sabarna, 22, and Roshdi Nasri Sabarna, 21, taking them to an unknown destination. The soldiers also detained two other Palestinians, confiscated their ID cards and the keys to their vehicles. Another Palestinian, identified as Ahmad Khalil Abu Hashem, was handed a military order to head to the Etzion military base for interrogation. Israeli naval forces opened fire off the coast of northern Gaza, late Wednesday, injuring a Palestinian fisherman, according to local reports. Ma'an News Agency reports that one Yousef Zayif, age 70, was hit by live fire while waiting for his sons on the shore of a beach near al-Sudaniya. 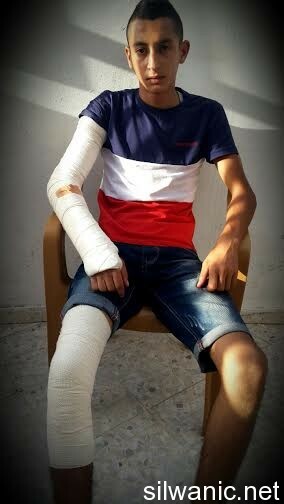 Medics described his injuries as "moderate", while the Israeli army did not return calls seeking comment. 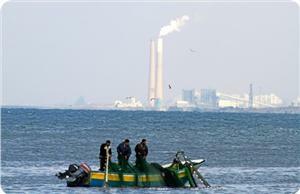 M'an further reports that, on Sunday, an Israeli warship opened fire at Palestinian fishermen off the coast of Gaza City's al-Shati refugee camp. Speaker for the Union of Gaza Fishermen, Nizar Ayyash, told Ma'an that Israeli gunboats "have been firing at fishermen every day since the ceasefire agreement was signed." 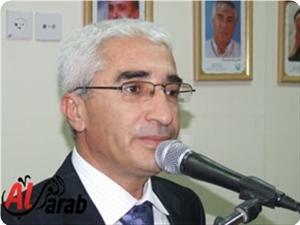 He also said that naval forces have detained six Palestinian fishermen since the truce was first called in August. Furthermore, the Israeli blockade in place since 2006 -- and backed by Egypt since 2007 -- has severely limited imports and exports within the Gaza Strip, and has led to frequent humanitarian crises and hardship for Gazans. 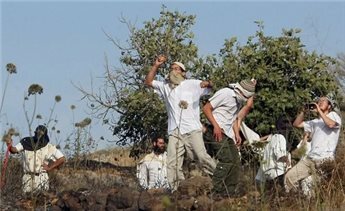 A number of fanatic Israeli settlers attacked, on Wednesday evening, several Palestinian cars driving on the main Jenin-Tulkarem road, southwest of Jenin, in the northern part of the occupied West Bank. 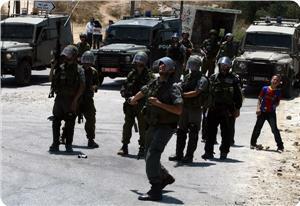 Soldiers invaded Ya’bad, near Jenin; many Palestinians were injured. 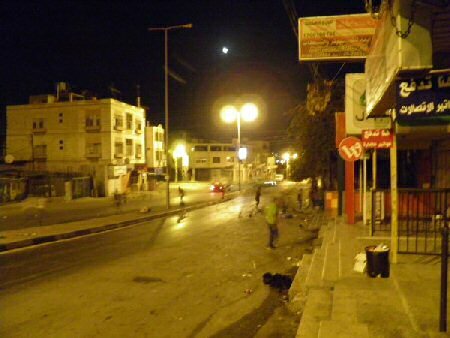 Local sources in Jenin said several settlers of the Mabo Dontan illegitimate Israeli settlement, threw stones and empty bottles at Palestinian cars, and gathered in the middle of the street to block traffic. The attacks led to damages but no injuries. Later on, Israeli soldiers installed roadblocks east of west of Ya’bad, stopped and searched dozens of Palestinian cars, and failed to remove or apprehend the extremist settlers. Also on Wednesday evening, Samer Abu Bakr, head of the Ya’bad Town Council, said several armored Israeli military jeeps invaded Ya’bad, and fired rounds of live ammunition, gas bombs, concussion grenades and rubber-coated metal bullets, during clashes between the invading soldiers and local youth. Medical sources said that dozens of residents received treatment for the effects of tear gas inhalation.